An intrepid journalist joins a real-life Arctic search team seeking details about "three American military planes that crashed in Greenland during World War II." Zuckoff’s (Journalism/Boston Univ. ; Lost in Shangri-La: A True Story of Survival, Adventure, and the Most Incredible Rescue Mission of World War II, 2011, etc.) 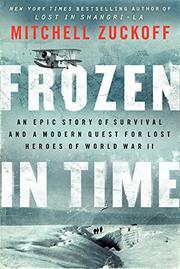 complex narrative involves the fates of three downed missions to Greenland in late 1942, juxtaposed with the events of the modern-day search effort, led by an exploration company in August 2012 and joined by the author. As a result of the many competing strands and characters, some confusion in the details ensues—though maps and a cast of characters are included to help orient readers. The original lost cargo plane, which contained five American servicemen, was part of the wartime Operation BOLERO’s so-called Snowball Route from the U.S. to Britain; on November 5, 1942, it crashed on an ice cap near the southeast coast of Greenland. Due to terrible winter storms, the plane’s radio messages grew increasingly weak, making it impossible to locate the plane for the subsequent B-17 bomber that took off days later on a rescue mission. Carrying nine crew members, the B-17 hit a whiteout and crashed into a glacier. The broken-off tail section remained intact, allowing the survivors to take shelter, but one man had already fallen through an ice bridge, another grew delusional and another had his feet frozen. In order to rescue this batch, a Grumman “Duck” plane was launched, carrying pilot John Pritchard and radioman Benjamin Bottoms; despite rescuing some of the survivors, the Duck vanished in a storm, remaining unclaimed until Lou Sapienza’s expedition of 2012. Much of the blow-by-blow narrative concerns the plight of the crews, as well as the elaborate outfitting for the Duck Hunt. An exhaustively layered but exciting account involving characters of enormous courage and stamina.